Enter promo code “HELLOLA”. $15 Off First App Ride. Offer valid only when paying with a stored credit card in the RideYellow app in Long Beach CA. Promotions cannot be combined. This promotion applies automatically to each ride only when paying with a stored credit card in the app in Los Angeles CA. Limited time offer. Promotions cannot be combined. Need a Ride to LAX? The RideYellow app works at LAX too. We have taxis’ waiting outside the terminals ready to take you anywhere. Additionally, we have a full list of Flat Rates for trips leaving LAX to anywhere in LA! Santa Monica is a nice fresh pace compared to Los Angeles. Santa Monica is still a bit crowed and there is quite a bit of hustle and bustle, but the coastal breeze and vibe makes up for its crowdedness. 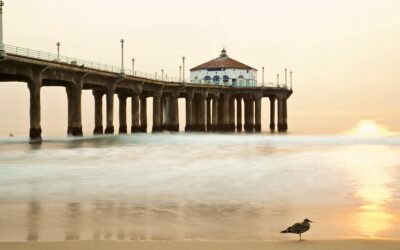 There are many reasons to visit Santa Monica so lets go over some popular destinations that might convince you go here. The Santa Monica Pier is a popular destination of Santa Monica because of all the attraction on it. Not only does it have a great view of the ocean and beach, but it has a full amusement park on it with rollercoasters and games! The 3rd Street Promenade is Santa Monica’s outdoor mall. The Promenade has a lot of boutique and also well known commercial clothing shops. many come to walk the Promenade and also watch the many street performance acts that go down here. The Santa Monica beach is a very popular beach because of its location. You can walk the Promenade enjoy the Pier rides and then go lay out on the beach and watch the waves.